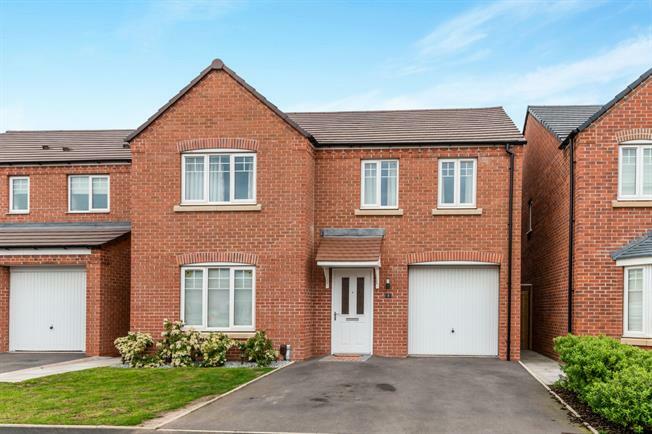 4 Bedroom Detached House For Sale in Stafford for Offers in the region of £290,000. This superb modern detached family home must be viewed! Benefitting from village location with nearby local amenities, and great accommodation comprising entrance hall, lounge, dining room, dining kitchen, guest WC, master bedroom with en-suite shower room, bedroom two with en-suite shower room, two further bedrooms and a family bathroom. Outside, to the front there is a lawned garden with driveway providing off road parking which leads to the garage. Gated access to the rear of the property where a further lawned garden can be found. Having tiled flooring, radiator, stairs to the first floor and understairs storage cupboard. Having a range of matching wall and base units with work surfaces over incorporating a one and a half bowl draining sink unit, built-in electric oven with gas hob with cooker hood over, tiled splashbacks, integrated fridge freezer and dishwasher, radiator and double glazed french doors to the rear. Having double glazed window to front, two radiators and half glazed double doors leading into dining room. Double glazed french doors with side panels to the rear and radiator. Having loft access, radiator and airing cupboard. Having low level WC, pedestal wash hand basin with tiled splashbacks, radiator and tiled flooring. Having double glazed window to front, two separate built-in wardrobes with sliding mirrored doors and radiator. Having tiled shower cubicle, pedestal wash hand basin, low level WC, tiled flooring, heated towel radiator and double glazed window to the side. Having double glazed window to the front, built-in wardrobe, storage cupboard and radiator. Having tiled shower cubicle, pedestal wash hand basin, tiled flooring, tiled splashbacks, double glazed window to side and heated towel radiator. Having panelled bath with shower over, pedestal wash hand basin, low level WC, tiled floor and part tiled walls, heated towel radiator and double glazed window. Having double glazed window to the rear and radiator. To the front there is a lawned garden with driveway providing off road parking and gated access to the rear. The rear garden is mainly laid to lawn.